I officially own no DK weight yarn. How is that possible? I have drawers and drawers and drawers full, entire dressers full, more bins full than I can count, a large cedar chest and two closets full of yarn... And not a single skein is marked DK. How is that possible? The closest I came was something labeled "sporty." So why the urgent need for DK weight yarn? My local yarn shop (remember me talking about Center of the Yarniverse opening?) hosted their very first Sit and Stitch this past week. The shop itself is on the smallish side so they worked out a deal with Ashland Coffee and Tea to have it at their place. Good thing too! Twenty-eight people showed up for the event! The location couldn't have been better suited for the group. Lots of large tables, sofas and comfy seating areas. The cafe wasn't open for business so we didn't get coffee and cookies, but it was still a fantastic time. So, what does the Yarniverse's first ever Sit and Stitch have to do with my need of DK weight yarn? Andrea Craig from Knitting for Sanity was there with her Chevlace hat. I instantly fell in love. The only hitch - the pattern calls for DK weight yarn. After tearing through my entire yarn stash and not finding any, I considered making the trek to the yarn shop but it was after hours and pouring down rain. (When in the last 400 days has it not been pouring down rain???) Unable to wait, I decided to go with two skeins I found called Ewe So Sporty. I also decided to go with knitting the medium sized hat. 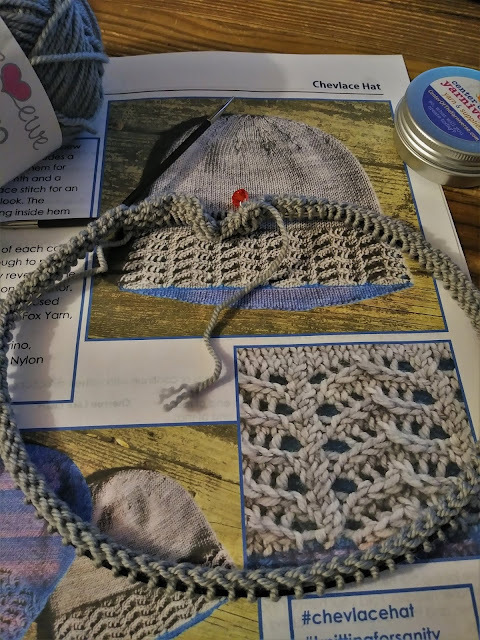 Because as you know, I'm not bothering with a gauge check... and I figured it would still be wearable by some human if the hat turned out slightly smaller or larger than expected. The main goal here is to knit the pattern, not to have a hat for my own head. So I'm using Ewe So Sporty in a pale gray and a pale blue. The gray will be the inside liner and the blue will be the outside. And I'm saying a prayer as I type this... because I was just reading the ball bands trying to find color names and realized the skeins contain almost 100 yards less than the pattern's recommended yarn. Andrea did say that two skeins of the recommended yarn was enough to make two hats though so.... Keeping my fingers crossed. And while you pray for me and keep your fingers crossed too, please ignore the weird coloring in the photo. Apparently I'm running out of colored ink so everything I print has that weird stripey effect. Lovely. And, while you are praying and crossing your fingers and ignoring weird stripes on photos.... if you are in the Richmond area, come join the next Sit and Stitch. It's going to be every Wednesday from 7 to 9 p.m. at Ashland Coffee and Tea. Hope to see you there! I miss my old knitting group. If I didn't have to trek down 95 (I hate it) I'd be right there with you! 95 is miserable, but it's a Wed. night - not much traffic. Come join us! I bet it will work out just fine. I almost never pay attention to gauge, often to my detriment though!